The two most influential actors in Hollywood who originally helped to popularize Panerai are Hollywood acting legends Sylvester Stallone and Arnold Schwarzenegger. How did this happen? In the future, I plan to expand on this story in detail, but I thought I would get it going now. The first five photos below were taken at the opening party for Planet Hollywood in Berlin on September 24, 1996. 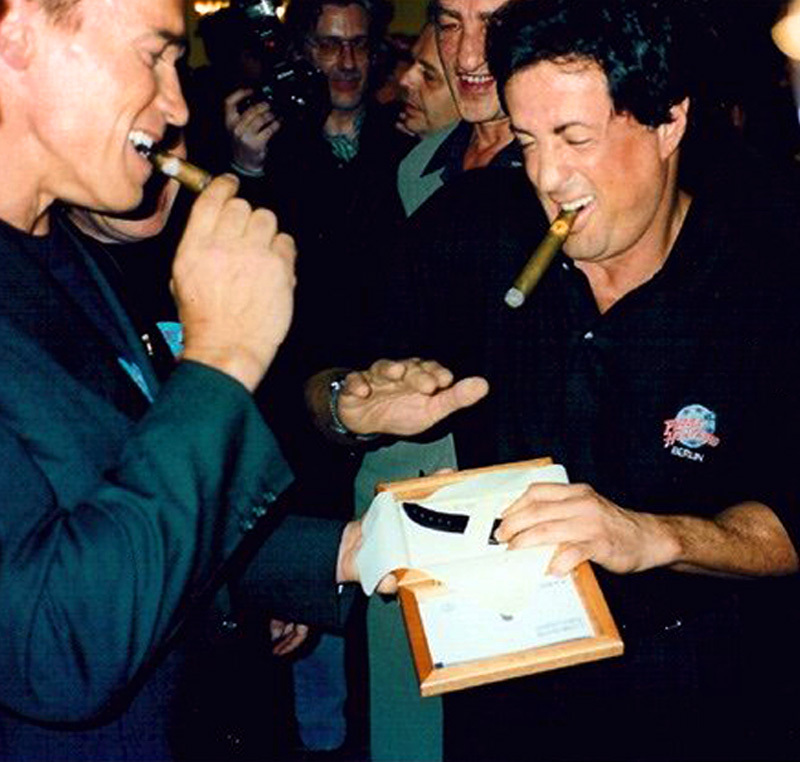 These photos show Sylvester Stallone giving his good pal, Arnold Schwarzenegger a gold played Panerai prototype. 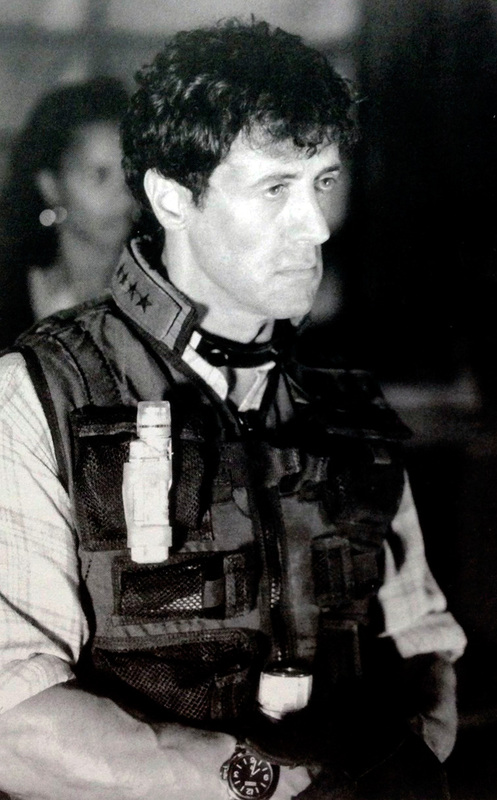 It is important to note that when Sly started wearing Panerai watches, he would always wear them on his right wrist. 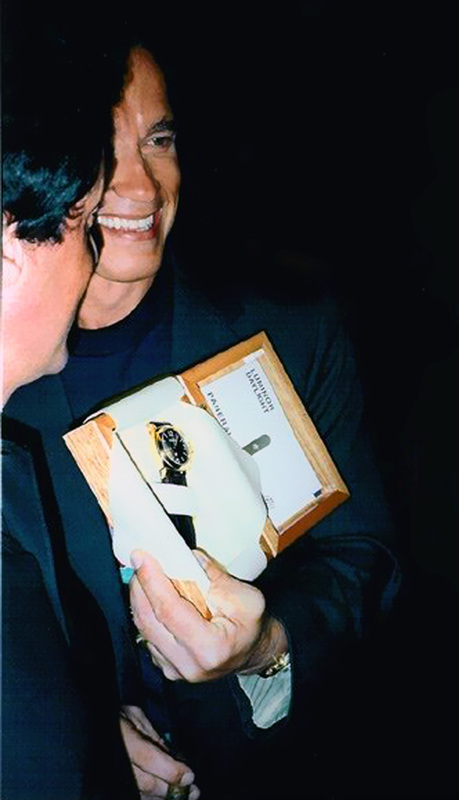 Arnold Schwarzenegger is pictured above and below showing off his Panerai which Sly gave to him that evening as a gift, and he appears to be very proud of his gift. 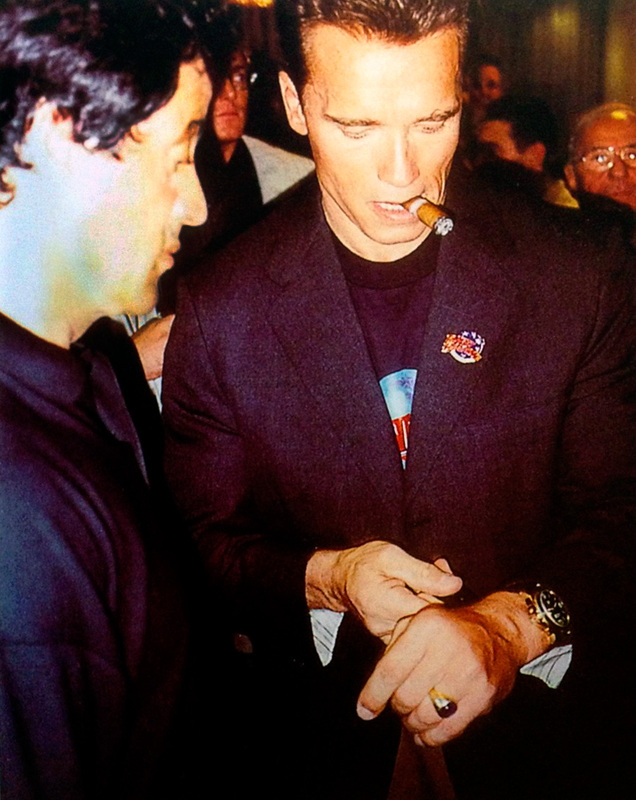 This fourth image shows Arnold Schwarzenegger trying on his Panerai Sly Tech model (Pre-Vendome Luminor Panerai Daylight Reference 5218-203A) that Sylvester Stallone gave him as a gift. 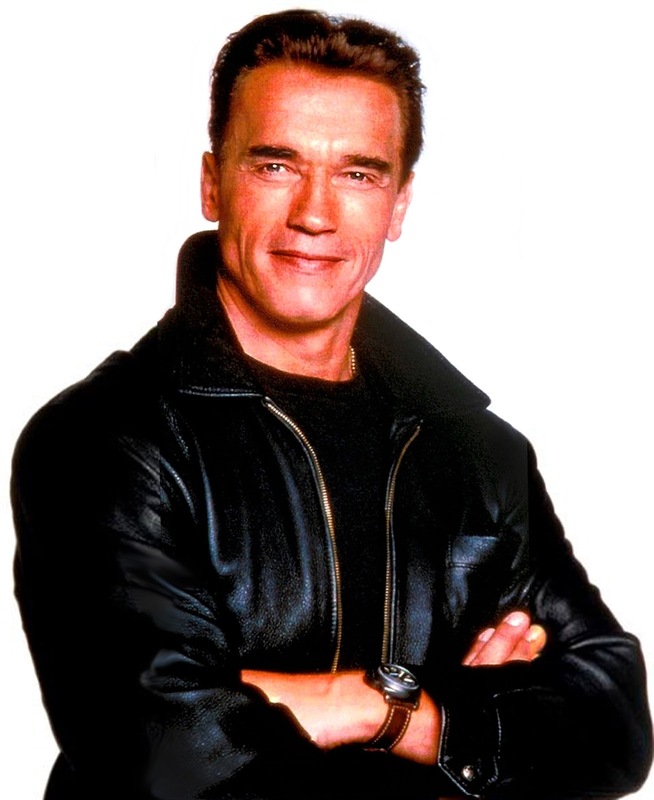 Arnold Schwarzenegger still wears his Sly Tech Panerai to this day. 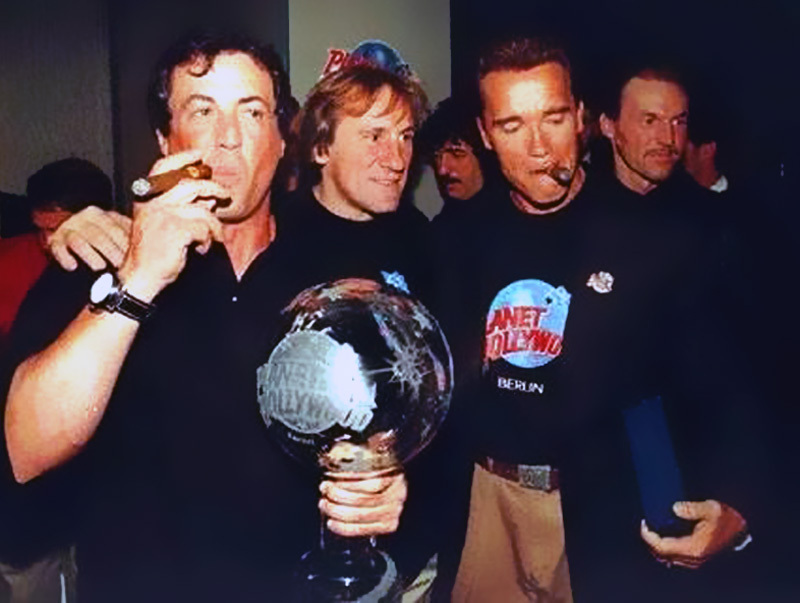 This next image shows Sylvester Stallone with Gerard Depardieu and Arnold Schwarzenegger at Planet Hollywood in Berlin. 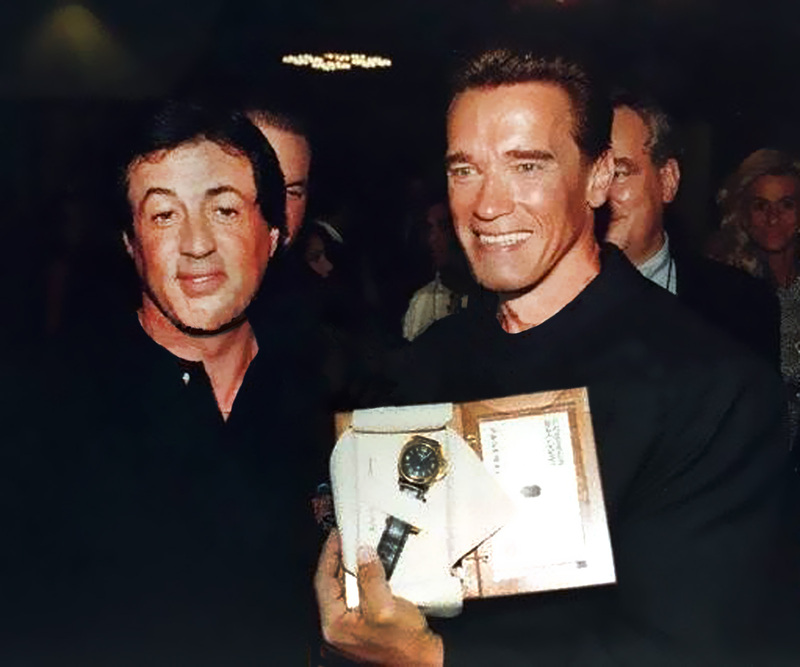 Sylvester Stallone is wearing his white dial Luminor Daylight Sly Tech Panerai, and Schwarzenegger is holding his Pre-V Gift Box. 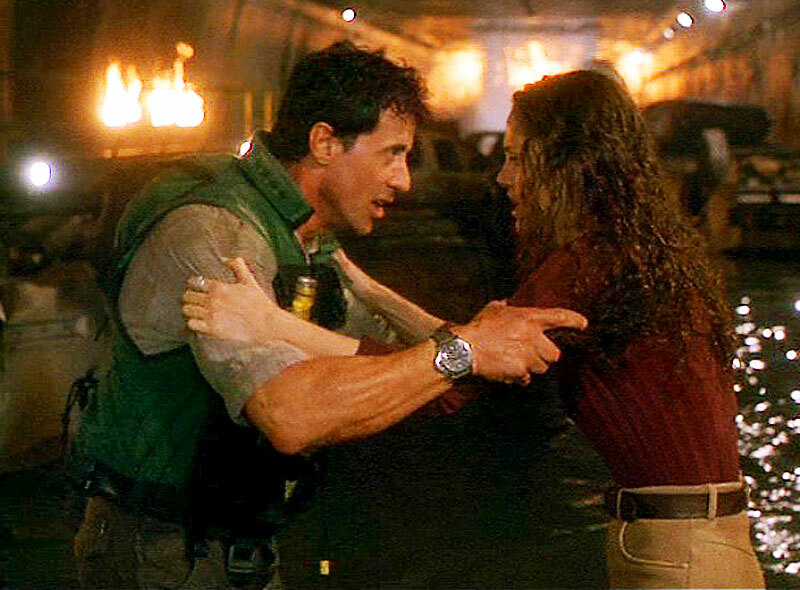 Sylvester Stallone wore a Pre-Vendome Panerai in his movie named Daylight which debuted December 6, 1996. The two photos below were taken on the set of Daylight. We See Arnold Schwarzenegger sporting his Pre-Vendome Panerai Reference 5218-203A in the two pictures below. The screen grab below shows Arnold Schwarzenegger wearing his Pre-V Panerai in the 1996 Movie named Eraser, and we see him talking to his co-star, Vanessa Williams. The 44MM Luminor Marina Panerai screen grab pictured below is from the opening scene of Arnold Schwarzenegger's 1996 movie named Eraser, which I remember seeing back in 1996 in a movie theater. 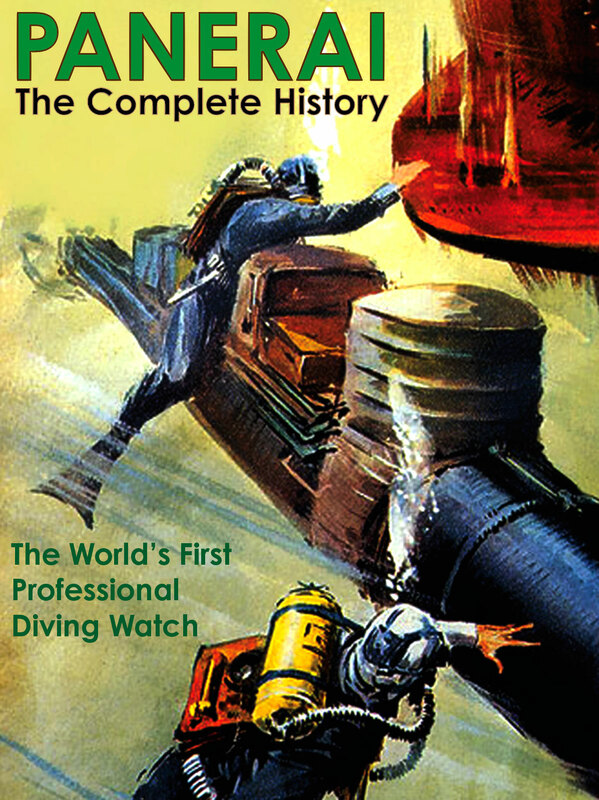 I think this was the first time I ever saw a Panerai watch. I think this is likely the first close-up of a Panerai in movie history, and for the record, the Panerai is in Arnold's characters hands. One of the obvious questions, is whether or not this was product placement, or was Schwarzenegger using the Panerai to make a high-tech/cool statement about his special agent character? Either way, I say it is really cool. 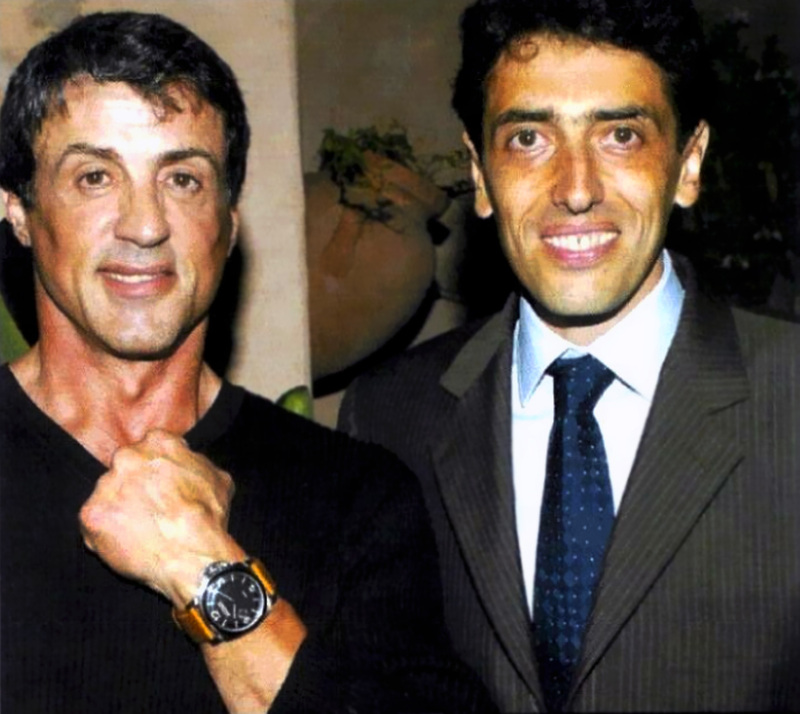 In the photo below we see Sylvester Stallone attending a special Panerai event on October 3, 2002, to launch the new Panerai 1950 "Fiddy" 47MM PAM00127, and he is standing next to Phillipe Bonay, who, at the time was the President of Panerai. 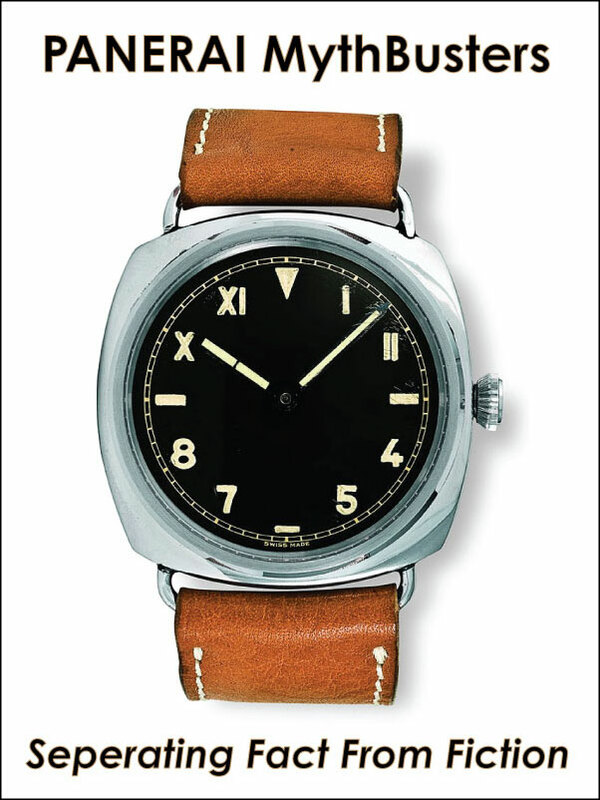 Sylvester Stallone is sporting a PAM127 in the photo below and when he spoke at the event he mentioned that when he first encountered Panerai watches in Florence, Italy in the first Panerai boutique, he knew they possessed a star quality, and he went on to mention how impressed he was with Panerai's enduring success. 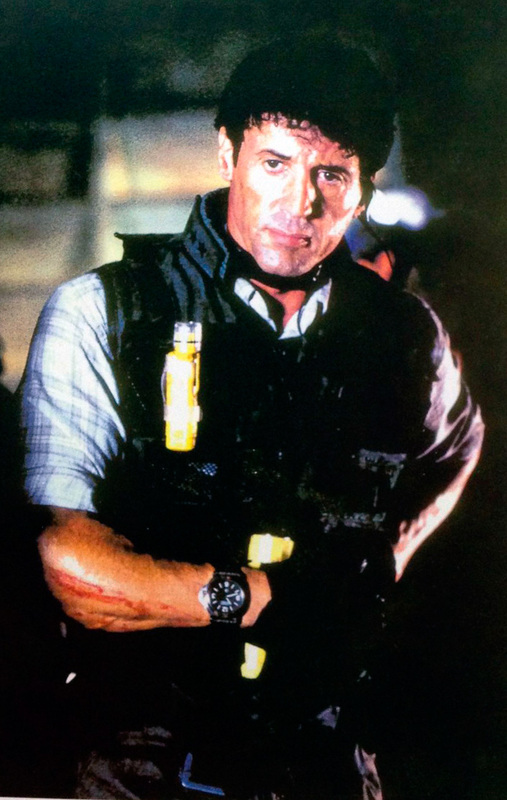 It is interesting to note in the photo above, we see Sylvester Stallone wearing his Panerai for the first time on his left wrist. 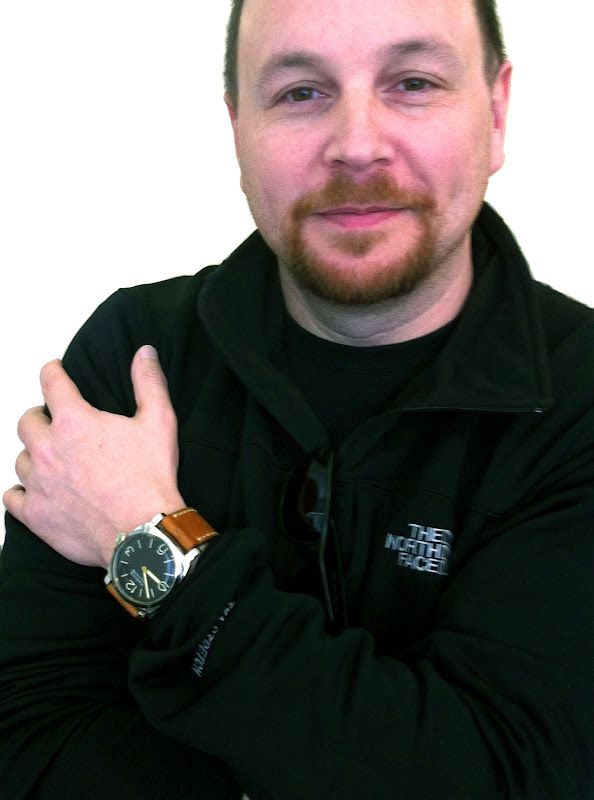 For some reason, as witnessed in all the prior photos, he always wore it on his right wrist? He's a lefty. Probably already had another on his right wrist.